Your time is valuable and your budget is real. You can count on our Professional Shoppers to choose only quality items for you. In addition, your Professional Shopper will place a courtesy call once we complete your order in case you need to add anything before we complete your order. Enjoy the convenience of shopping 24/7 and save precious time for the things that really matter to you. Monday – Sunday, 11am – 8pm. Orders must be placed by 5pm. Once you place your order you will receive an e-mail confirmation. Please call 1.800.826.8451 if you do not receive this confirmation. Orders must be placed at least 3 hours in advance of your pick up time. Once a time slot is full, you will no longer be able to select it during checkout. There is a $4.99 fee per order. We accept credit or debit cards. First time customers paying via credit card will be required to present the physical credit card and ID at pickup. Providing this service is the primary responsibility of every Go Cart Professional Shopper. Therefore, our Professional Shoppers or carry out staff do not accept tips. Your return business, recommendation to friends and family and thanks are the best tip we can receive. Your Professional Shopper will assemble your order in the Go Cart department, designed with a cooler and freezer, to store your products with maximum care, meeting the highest freshness and food safety standards. Curbside pick-up is available everyday from 11am until 8pm. Orders may be picked up as early as three hours after your order has been submitted and confirmed. Please refer to our pickup schedule below. 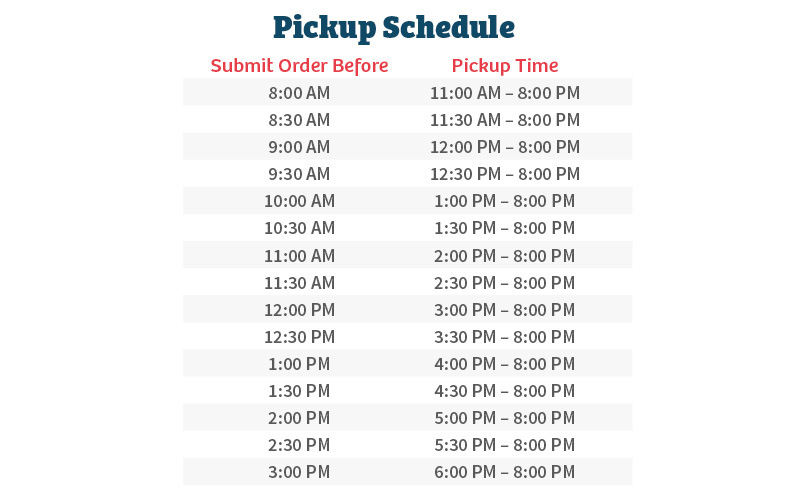 Please Note: There is a limit to the number of orders that are allowed for each pick up time slot. Once a time slot is full, you will no longer be able to select it during checkout. Once your order is submitted, simply drive up to our Go Cart drive-thru area. The Go Cart pickup area is located near the front of the store. Just look for the GoCart pick up sign. If you are paying by credit card please present your photo ID and actual credit card. You may either pay Online when you complete your order or pay at pick-up. If you pay at pick-up we will swipe your credit or debit card when you arrive in the pick-up lane using a portable credit card machine, keeping your card in your possession at all times. No additional fee, no need to leave your car. Yes, you can if the store has already starting picking your order. Simply login "login" to your FoodCity.com account. Click on “My Account” at the top of the screen. Select “Order History” from the drop down menu. The Order History screen will display a current list of your orders. Click on “add items to order” to make any additions to your current order. You can then search the website for the items you wish to add. Click on the items and you will be prompted to create a new order or add to your current order. If the store has already starting picking your order you can call/text the professional shopper and add items over the phone. All valid manufacturer and store coupons are welcome with your Go Cart order. Give your coupons to the Professional Shopper at curbside pick-up. Food City advertised prices change every Wednesday at 12:01am in our stores. We update Go Cart at 3:01am on Wednesday with the new sales prices so that you will see the correct sales that correspond with your pickup day. If you are ordering sale items at the beginning of the week for Wednesday or later pickup, you will be charged the price of the items on the day the order is shopped. Your estimated total may vary from the actual purchase total by the change in advertised prices along with the minor price variations for items that are sold by the pound. From time to time data transmissions may cause a price to be incorrect within our online store. We will correct any issue we become aware of at the earliest time possible. Customer service issues that may arise from a data transmission error will be handled through our standard customer service process. In the checkout process we will ask you if you would like to allow for substitutions. Our goal is to never be out of stock on any item. However, if an item is out of stock we will make every effort to contact you and substitute with an item as close to the size and price of the item ordered. If you would like to accept our substitution policy, just check the box provided. Please be sure to include your contact numbers so we can reach you. All Go Cart Professional Shoppers are well trained in our Go Cart Professional Shopping training program. They are trained on how to select the freshest products for your family and how to store your perishable products at the appropriate temperatures. How Mother Nature Can Affect Your Order? Our hope is that ‘Mother Nature’ will never prevent you from picking up your groceries in a timely manner. Please let us know if you will be delayed in picking up your order. Furthermore, we will have your Professional Shopper contact you in the event that your order will be delayed due to weather or power outages. Our online store is always growing. If you cannot find an item but you would like to add it to today's order, please notate this information in the "comments for your professional shopper" section. Please enter as much information as possible about the product and if the store carries the item it will be added to your order. Orders containing alcoholic beverages and tobacco (where sold) will be available for pickup or delivery. Prior to handing the customer their order, our employee, or delivery person, must check your driver's license to verify age. If an adult over the age of 21 is not present at the time of pickup or delivery, any alcohol products will be removed from the order. Tobacco purchasers must be at least 18 years of age and also have valid proof of age or the tobacco items will be removed from the order. Many municipalities and counties limit the sale of alcohol on specified days and times of day. Our stores will follow the statutes of each state, county and local entity. Beer is sold in all stores in Kentucky, Virginia and Tennessee. Additionally wine is sold in all stores in Virginia.